She presided with Mayor Tom Rowland during the meeting. 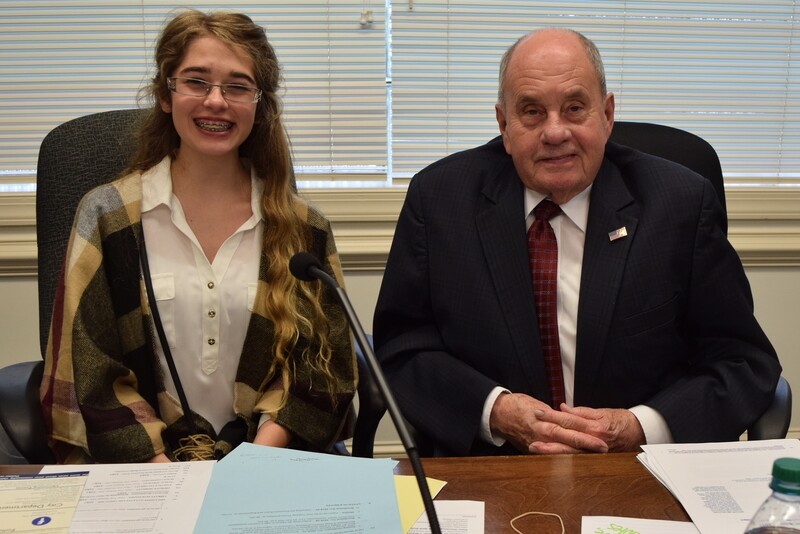 Olivia reviewed the Council’s agenda and called on Council members for their reports. Mayor Workman introduced her family. She has two sisters and a brother. Olivia is the daughter of Brian and Carrie Workman. She is a granddaughter of Jim and Marilyn Workman. Olivia was chosen as mayor of the day due to her community service through the Christmas Empty Stocking Fund. Last year she shopped and wrapped presents for children along with her dad, mom and sister Jules. Olivia gave many volunteer hours and was a very dedicated shopper, carefully selecting each gift she purchased. Olivia’s mom, Carrie, is a noted photographer in the area. Her dad, Brian, is an associate with Bender Realty. Her grandparents, Jim and Marilyn Workman, are long time volunteers shopping for children. Plus, the Bender Realty team helps with the wrapping and volunteering for the big Empty Stocking Fund Party.